Your thyroid produces a hormone that facilitates your body’s development and controls your energy level. When the thyroid does not produce enough of that chemical, you develop a condition known as hypothyroidism. Levothyroxine offsets the lack of hormone so your body continues to function properly. But the drug may not be effective if you take magnesium. Talk to your doctor before adding the supplement to your diet. Among the different types of magnesium, there is magnesium hydroxide, an antacid that affects how levothyroxine performs. The thyroid drug has a synthetic salt -- T4 -- similar to the substance by the same name that the thyroid gland produces. When you take the drug and magnesium hydroxide during the same period, the antacid can attach itself to T4. As a result, your body takes longer to absorb T4, or it might not be able to assimilate it at all. When that happens, you continue to suffer from hypothyroidism despite taking the medicine. There is no readily available information on whether levothyroxine neutralizes magnesium hydroxide’s antacid properties. As an antacid, magnesium hydroxide neutralizes stomach acidity to relieve indigestion. The mineral also stimulates the bowels, alleviating occasional constipation. You also can take magnesium hydroxide to correct a deficiency of the mineral in your body. 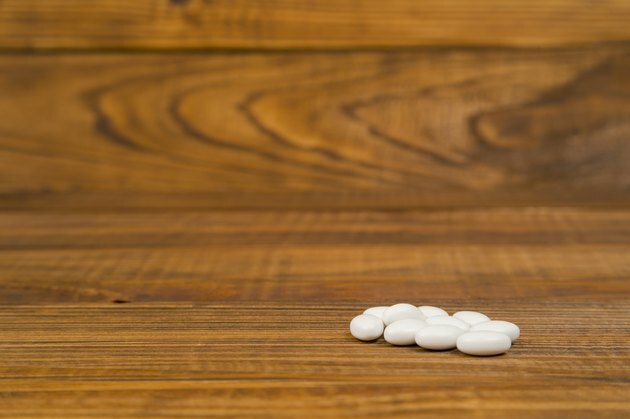 Since the antacid in this type of magnesium affects levothyroxine, your doctor may be able to recommend a different magnesium supplement. According to the University of Maryland Medical Center, your body easily absorbs magnesium citrate, magnesium gluconate and magnesium lactate. They may substitute for magnesium hydroxide, depending on your reason for taking it. Magnesium citrate is mostly used as a laxative. This supplement may also interfere with blood thinners, heart medicines and psychiatric drugs. Magnesium gluconate corrects magnesium deficiency. It also supports the health of muscles and nerves. Likewise, magnesium lactate treats low levels of the mineral. Besides, this supplement has an antacid component that relieves indigestion and heartburn. Although the literature on levothyroxine does not name magnesium lactate as a substance that interacts with the drug, it might, according to Drugs.com. Regardless, only make substitutions that your doctor prescribes. If you supplement magnesium to raise its levels in your body, discuss with your doctor the possibility of adjusting your diet to reach that goal. Greens are sources of magnesium because the mineral is part of chlorophyll. The fish halibut also provides a good amount of the nutrient, and so do legumes, vegetables and whole grains.